You are here: Home / Resources / Help Us #ProveThemWrong, Start Something Awesome, and Be in Our Video! It’s awesome to see so many people with special needs proving to the world that what it may think about them is wrong! Stories like this, and this, and this. We see so many of your children are doing awesome things as well! We want to invite you to be a part of a fun new campaign we’re doing called the #PROVETHEMWRONG campaign and show the world how your children are doing that! I’m going to be making a video for World Down Syndrome Day and I want you / your family in it! Keep reading to find out how. Click here to buy a #PROVETHEMWRONG tee shirt. When you receive your shirt in the mail take a picture of your child (or entire family) wearing the shirt(s) and share it on social media (Facebook, Instagram, Twitter) with a brief caption explaining how your child is proving the world wrong about it’s view regarding people with special needs, and use the hashtag #PROVETHEMWRONG. Be sure to come back to this blog post and leave your picture in the comments! We’ll be making an awareness video that will release for World Down Syndrome Day 2018 out of all of the pictures! Simply email a picture of your child / family wearing the shirt to info@noahsdad.com. Everyone who sends me a picture by March 1 will be included in the video! We will then share this on our Facebook and blog! We want as many people as we can to appear in our video. This is going to be awesome!! You just created awareness! You’re awesome. 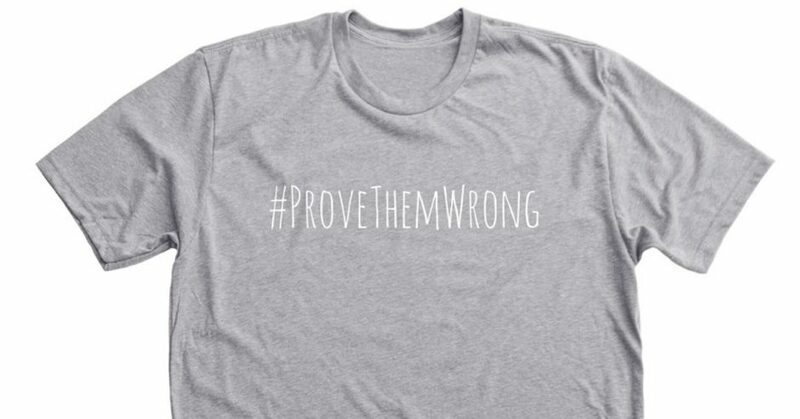 It will be fun to see everyone rocking the #PROVETHEMWRONG shirts! Feel free to buy the shirts for your family, friends, teachers, etc and include them in the picture! Help Us Do Something Awesome….! You may have noticed I’ve been posting to this blog more consistently as of late. Our family is in the process of little bit of a change in our life (which I’ll share more about in the coming months) and part of that I hope will involve sharing some of our story here. If you’re interested in learning more about what we’re working on, or possible being involved in a bigger way, please contact me directly. I can’t to share with you guys more about what’s we’re working on when the time is right! I’m looking forward to seeing lots of you guys rocking the #PROVETHEMWRONG shirts! Rick, I often read your posts and enjoy them greatly. But not this one! Prove Them Wrong slogan sounds as if it’s convicting people when all I have seen from my 3 years of loving and spending lots of time with our beautiful granddaughter is a world of praise, acceptance, and growing understanding. I feel this way about racism also: let’s celebrate how far we have come instead of hammering away at the little bit left to go. Keep up the posts! As a special needs preschool teacher, I often witness well- intentioned individuals unintentionally set goals that are well below the bar of what a child with DS, etc. is capable of achieving. I have often witnessed this be a crippling tool that is used by educators and parents (not all but more than I would like) as a crutch, a reason to not try for a successful life. I am MORE THAN HAPPY to join your team and prove them wrong! My sons name is also Noah. He would be 8 almost 9 this year. He was born with DS. He was my best friend. He defenitly proved everyone wrong. He passed away from Leukemia on Jan 29th 2016. I always wanted him to be apart of World Down Syndrome day. Can I still do this some how. I am so sorry to hear about your son, I know that is really hard. You for SURE can be a part of the video we are making for World Down Syndrome 2018! Feel free to follow the instructions in the post. Let me know if you have any questions!